Medicine combined with a passion for helping others runs in Jordan Bray’s family. Bray just finished his first year of medical school at Kansas City University of Medicine and Biosciences (KCU). He is also part of a growing trend of medical students who are making an impact on the health of people around the world. 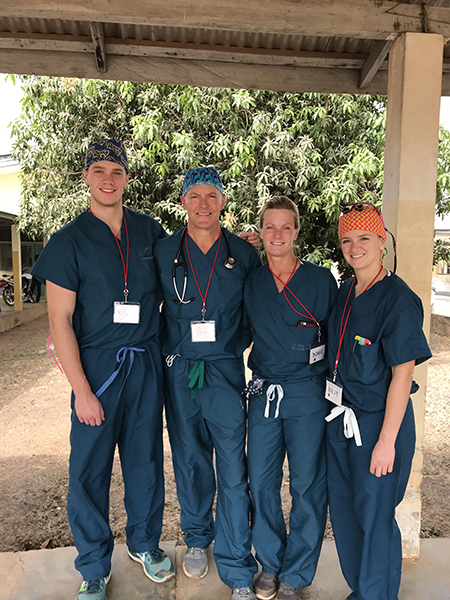 In January while on winter break, Bray traveled to northern Ghana on the western coast of Africa to take part in a surgical mission trip with his family. The group called Care4Ghana was made up of physicians, nurses and volunteers primarily from Mercy Hospital in Washington, Mo. “To be taught by some experienced surgeons and others who really know what they are doing…is really cool.” Bray said. The group also included Bray’s dad, mom and sister. In fact, his interest in medicine can be traced to his dad, Jeffrey Bray, DO, an anesthesiologist who graduated from A.T. Still University in Kirksville, Mo. His sister Haley is an otolaryngology resident in St. Louis. On the trip, his mom was busy working as an X-ray technician. “She just wanted to do anything they needed.” Bray added. The family worked closely, facing the challenges of the medical limitations in Ghana. Bray recalls the time he assisted his sister during an operation. His father was also in the operating room. “Learning from my dad and my sister, as well as other surgeons, was a really unique opportunity.” he added. Bray is an example of how Millennials – young people in their 20s and early 30s – are changing the philanthropic landscape by seeking out experiences to give back. For a young medical student, a mission trip can a great opportunity to help improve a community while sharpening their skills. 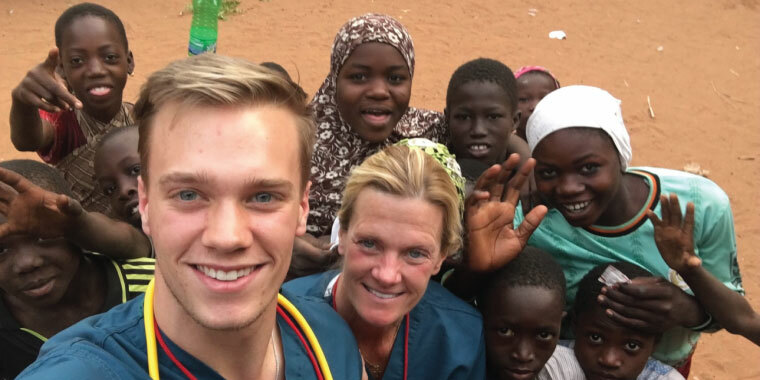 Experts say a quality medical school education provides students opportunities to do service projects in countries that lack adequate healthcare. Read more here in U.S News and World Report. KCU Board of Trustees Chairman, John P. Smith, DO, has gone on medical mission trips – 27 total by his count – starting in 1997. He sees many benefits to medical students such as the immediate gratification from using their skills. During the time the Bray family spent in Ghana, the medical team completed more than 100 operations. Cases included hernia repairs, thyroidectomies, hysterectomies and emergency operations. Jordan’s father believes “approximately 3,000 lives were improved and potentially saved” by the work done by the medical group. Bray has his hopes set on traveling again, especially with his family. “I think this defines what a physician really is; going out of our way beyond compensation to help people who don’t have access to quality health care.” Bray added.